UNITED NATIONS, November 29 -- Indictments of the International Criminal Court should not be sidestepped with "some form of fancy amnesty" as threatened in Uganda, Ethiopia should join the Court, and Ban Ki-moon should have more publicly urged the arrest of the ICC's two Sudanese indictees. These were among the positions pushed Thursday at the UN, just before the two-week meeting of the 105 ICC member states. Inner City Press asked Ndifuna Mohammed of Uganda's Human Rights Network about the failure to arrest the Lord's Resistance Army indictees. He asked with a question about the argument Uganda's Museveni government recently had with the Democratic Republic of the Congo, urging the DRC to "flush out" the LRA rather than arrest them. Video here, from Minute 41:26. He also questioned why the ICC has not investigated, much less indicted, any in Uganda's army, for war crimes not only in Acholiland but also Karamoja, where villages are burned in the name of disarmament. "The Karimojong took to buying weapons to re-sell them to the government," he said, shaking his head. Then the violence escalated. Inner City Press also asked if there are any moves afoot to investigate war crimes in Somalia. William Pace of the Coalition for the ICC responded that "we continue to insist that Ethiopia, the capital of the African Union, will ratify the Rome Statute" of the ICC. It might be added that Ethiopia benefits from numerous UN sub-headquarters. Richard Dicker of Human Rights Watch responded on Uganda, that "we're not critical" of UN agencies for "meeting with Joseph Kony or possible the late Vincent Otti." Inner City Press had asked the panel for any insight into Otti's fate, and followed up by asking about the obligations of state parties to the ICC and of UN agencies to arrest indictees on sight. 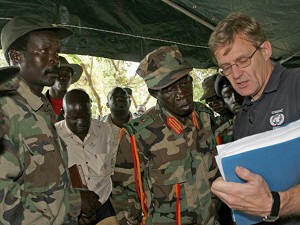 Dicker's answers was round-about: that Uganda had referred the LRA to the Court because they couldn't apprehend them. Fine. But can UN officials stand next to indictees and do nothing? Apparently yes. Dicker and Osamn Hammaida, identified on the flier as a "Sudanese activist," both criticized Ban Ki-moon for either not having raised the ICC indictments to president Bashir, or not having made this public after their meetings. Inner City Press asked Dicker if HRW was as insistent about the UN raising the continued freedom and impunity of the Uganda indictees. Dicker responded that the Uganda case presented the ying and yang of justice and of peace. And Sudan doesn't? Dicker spoke about China's responsibility, and mentioned the Olympics. Somewhere, Mia Farrow and maybe Spielberg were smiling. But about Uganda's LRA, nothing. Nor about war crimes in Nepal and Colombia. Selective focus continues to plague this justice field, and will be explored in the next two weeks. Inner City Press: On Cote d'Ivoire, there's this report that the Messenger of Peace Alpha Blondy, a musician from Cote d'Ivoire... First, is he no longer a Messenger for Peace? He seems to have written an open letter saying that UNOCI has said that he no longer is, and he's said that only the Secretary-General can make that decision. Are you aware of any change in his status as a messenger of peace? Spokesperson: Not that I know of, but I can check on that for you. Spokesperson: Yes. I'm aware of the information; however, we don't have any confirmation of that. I'll try to get more for you. But we thought he was only a "Musician" for Peace... Watch this site.